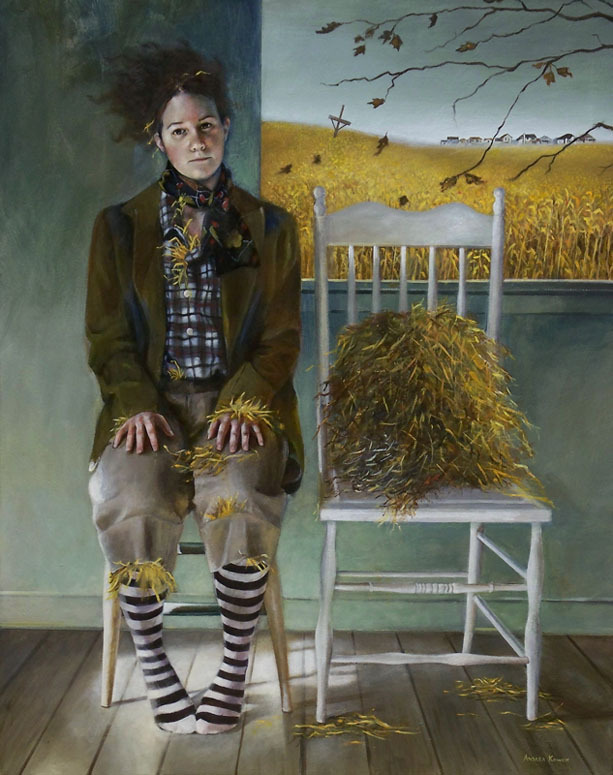 Andrea Kowch is an American (Detroit, Michigan) artist who adopted the One Painting a Day practice, citing it as “great discipline and good exercise.” Her daily paintings, usually still life, are workmanlike, but it is the larger pieces where, to my mind, most of the original concepts concentrate. Andrea’s artwork may be seen on her website (currently under construction), on the New Works blog and on the Mini Paintings blog. In this review I would like to discuss the series of paintings inspired by the declared idea of preserving the environment. This is magical realism: there are no mythical or mystical objects or creatures — only symbolic items and arrangements; the magic is in the lighting, the colors, and in the compositions. Long skylines cut through the canvases “beheading” the women and creating a sense of precipice. The scarecrow has already been decapitated, yet seems alive just as the female models are — but perhaps “alive” here is much more closer to “dead” (the pale bluish tones of the skin color the faces ghastly, and impart a deathly appearance). 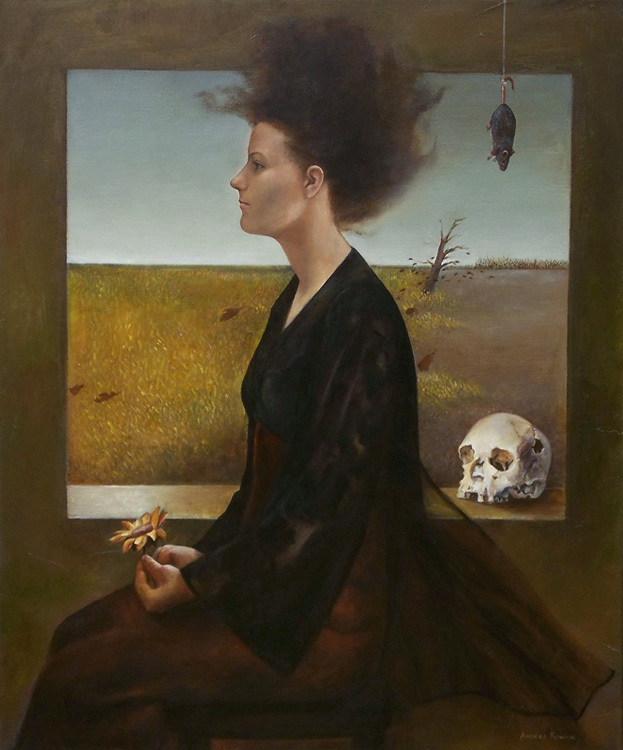 The artist both communicates and creatively exploits this ambiguity: humankind will rock between life and death if we don’t do something about climate change and/or global warming. There is another curious feature that may be interpreted as a sign of ecological awareness. The hair that flows backwards supposedly informs the direction of the wind. The depicted setting, however, may seem too quiet for a real wind to “exist” in it; the existense of the flow thus would imply on the inner state of the model. In other words, the apparent indication of wind may serve as a visual metaphor for a spiritual disposition, uneasy and tumultuous. Moreover, the backward, counter intuitive direction of hair flow would signify the artist’s desire to portray a protest. It is possible to recognize the context of the protest (again considering the calm, eerie surroundings) as of a placid and indifferent society on the one hand and of extinction and withering that seems to take place all around on the other. The contrast of the colors between the in- and outdoors creates (supported by complementing compositional division of space) a certain expectation and anticipation — I think that these feelings are to be resolved by each viewer individually. My own experience tells me that I would rather go outside, into the tempting open spaces seen from the windows — the vast yellow fields provide a relief and breadth of breath, a release of said contrast and tension. The passivity of the models issues a warning: their mannequin plastic look is the result of inaction. 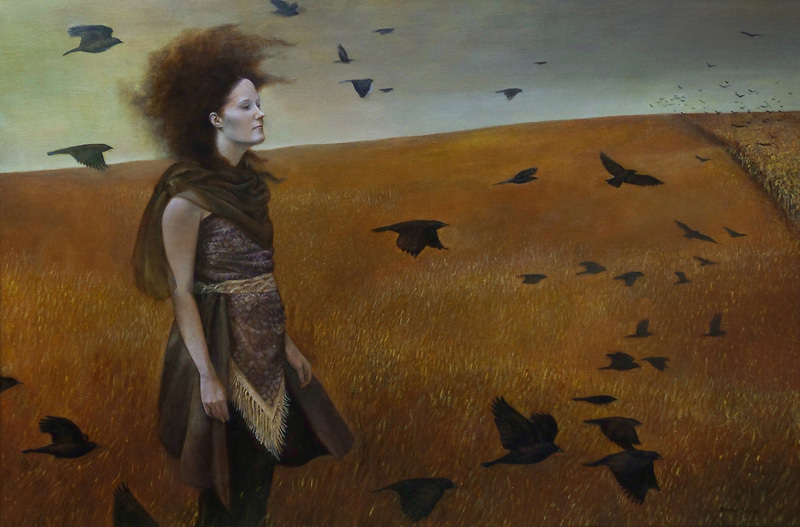 The recurring motif of black birds, visualized indirectly in the scare crow, forebodes inauspicious events. Finally, the allusion to Van Gogh’s Wheatfield with Crows is just too powerful to ignore; it elegantly imports an additional psychological layer and suggests a link between the socially oriented context and a personal one — to be injected by each viewer. Your paintings style is considerably close to that of Frida Kahlo. Not bad. I’m a fellow artist from your neck of the woods. Perhaps you would consider creating paintings that are similar to your surroundings, to bring awareness of the immediate need for reconstruction of Detroit? I have some ideas if you are interested, I however do not have the time to make such art. Thank you for your comment. I would recommend reposting it at the artist’s blog as well.